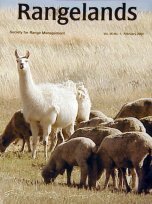 Rangelands is a full-color publication of the Society for Range Management and is published six times per year in February, April, June, August, October, and December. Each peer-reviewed issue of Rangelands features articles on the state of rangeland science (quantitative and qualitative), art, management, technology, policy, economics, education (formal and informal), society and culture ; along with book reviews, highlights from the relevant scientific literature, and society news. Additionally, readers may find youth, rancher, and international forums. The journal provides readers relevant information founded in the current rangeland science and management knowledge base in a user friendly, non-technical format. Rangelands is intended for a wide-range of individuals including educators, students, rangeland owners and managers, researchers, and policy leaders. Free online access to this journal is available within institutions in the developing world through the OARE (Online Access to Research in the Environment) with the United Nations Environment Programme (UNEP). and low cost access to the Band 2 countries.